Images from Mister Donut Japan. 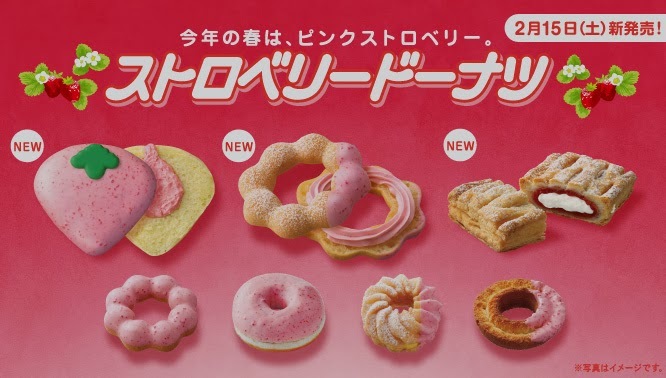 For spring, Mister Donut is releasing a host of strawberry-flavored donut options. Three of them are new (which you can tell by the little circles that say "new" in them). From left, top row: strawberry milk donut, strawberry milk pon de ring (a chewy donut made using rice flower), and strawberry whipped cream pie (made with strawberry jam). The prices range from 126 yen/$1.23 (the yeast-raised strawberry donut second from the left in the bottom row) to 168 yen/$1.64 (the strawberry milk donut). For the most part, they are variations on two single themes - one is a strawberry coating made with white chocolate and whipped cream either on its own or mixed with strawberry. The French crueller (second from right, bottom row) is filled with custard. Those who live in Japan already know that Mister Donut has a point card system in which you get a stamp in a little booklet when you buy donuts. After collecting a certain number of points, you can get certain promotional items. 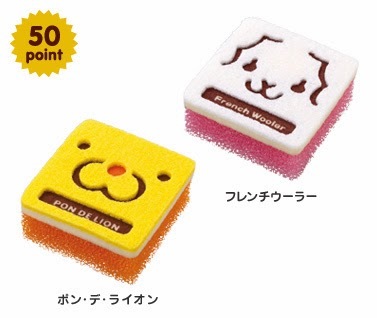 Of interest at present is a Duskin sponge with the pon de lion or French crueller mascot on it. When I was in Japan, I often saw a variety of such rewards like little bags, bento boxes, and, most frequently, various dishes (cups, plates, bowls), but this is the first time I've seen dish sponges. You need 50 points to get these and, as a point of comparison, you can also get a free donut for 50 points or a free drink for 100 points. I think it says something about the Misdo customer base that they would offer cleaning products as a prize. It lets you know that they are overwhelmingly female. I can attest that the strawberry whipped cream pie is awesome! I don't comment nearly enough but I do love your blog. I'm glad you kept up with it after moving back to the US. Thanks for your postings!!!! I may not be as surprised as you are about the sponges -- after all, Duskin owns Mister Donut. Unfortunately the point card system is no longer! It ended at the end of September last year, and customers have until March 24th to exchange any unused points. My family and only went once every couple of weeks, but that free cup of coffee or donut from points was a nice treat! Sarah: Thanks so much for sharing. It does look very tasty! I wish more things had whipped cream filling here (so few donuts in particular do)! It's one of the biggest things I miss about Japan! Hiyodori: I had no idea that Duskin owned Mr. Donut. That seems... weird. Also, if the point system is dead, why are they offering prizes? Are these just part of the phasing out process? Thanks for the information. I really appreciate it!